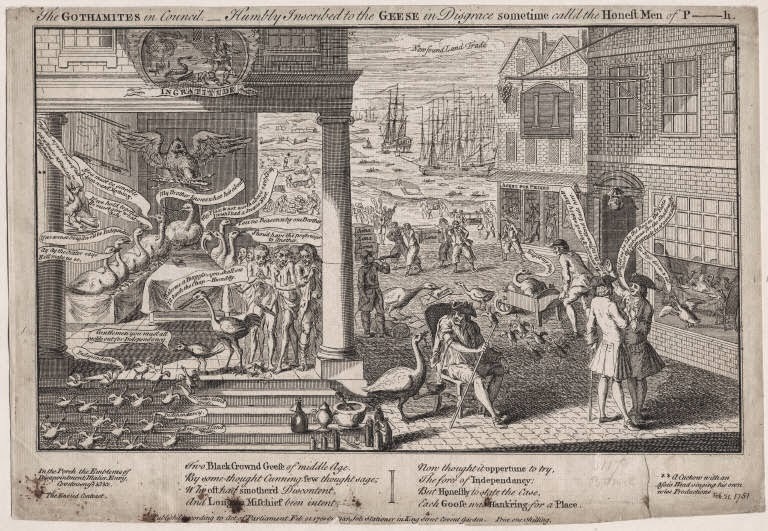 The Gothamites in council : humbly inscribed to the geese in disgrace sometime call'd the honest men of P-h, Frederick George Stephens, 1751, Walpole Library. Stephens has etched a crowded political cartoon, the meaning of which is beyond me. 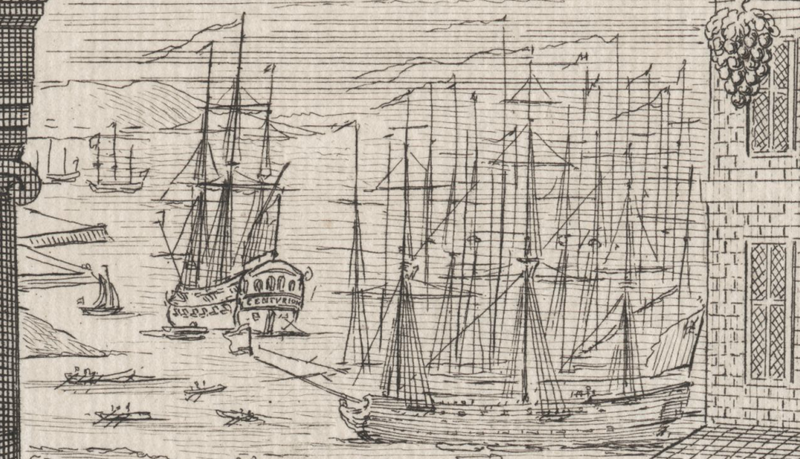 The presence of the Centurion, a legendary vessel commanded by the like of Anson and Keppel, accompanied by cheering tars pouring out of the "Agent for Prizes" suggests a recent victory. 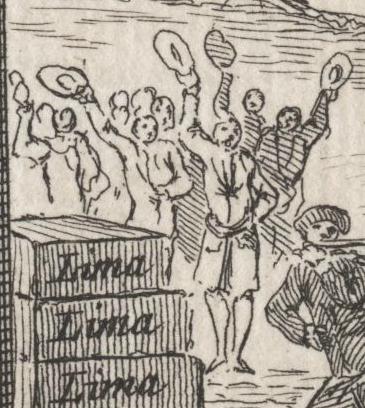 Being as the boxes the tars carry are marked "Lima," we can reasonably conclude that they are carrying Spanish silver. This silver was captured years before the print was made, but was cast into Lima Coins. Such a reference would have been self-evident to an eighteenth century English viewer. Behind the stacked Lima boxes on the left are a group of tars waving their round hats in triumph. They wear single breasted short jackets and slops that end right at the knee. Tasked with hauling a large box of silver on their shoulders, these tarpawlins nonetheless look pleased with themselves. Like their cheering mates to the left, they wear single brasted jackets and slops, though the slops end well below the knee. Here we can see that the length is quite variable. Uniformity of cloth type and clothing was fairly common, but slops were more like aprons than proper trousers. Each was probably made by the sailors themselves, rather than a tailor. We can expect more variety out of slops than we could of jackets, breeches, and shirts. The sailors' heargear is a bit more difficult to pin down. 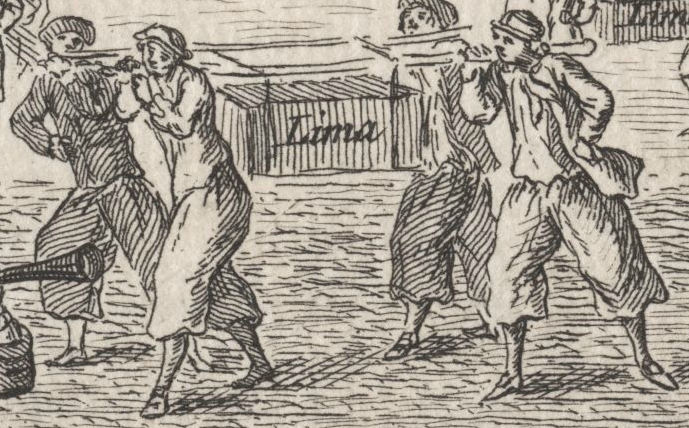 The fellow in the left foreground appears to be wearing a round hat with an upturned brim, but it could just as easily be interpreted as a cocked hat with narrow brim or a barge cap. 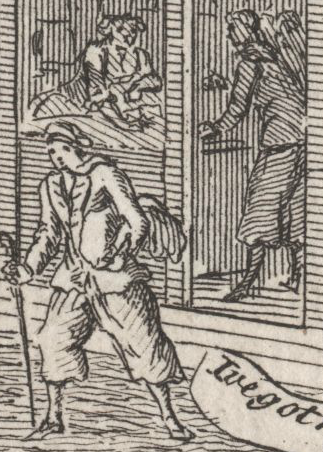 The same could be said of the jack without the waistcoat in the right foreground: is that a barge cap, a knit cap, a round hat? Strolling from the prize agent is another tar in slops. His jacket is somewhat hard to pin down: it could be double or single breasted. Certainly he wears a pair of slops and carries a stick, but his hat is similarly vague. We could say the same for the fellow standing in the doorway of the prize office. Interestingly, behind the desk of the prize office appears to be a woman. Her posture, bared forearms, and unmistakable fichu all demonstrate this fact. Were women known to work in prize offices? I confess myself ignorant, but it is an interesting avenue to explore!